Double room on sharing basis. On arrival in India, you will be greeted and assisted at the airport by our representative and transferred to your hotel. In its 3000 years of existence, seven cities have risen where the present capital of India stands. Here you’ll encounter a fascinating blend of the ancient and the contemporary, where government buildings, medieval palaces, and bazaars exist beside a modern metropolis. Delhi is a city waiting to be explored. Overnight at the hotel. After breakfast, enjoy a very interesting walking tour of Delhi. 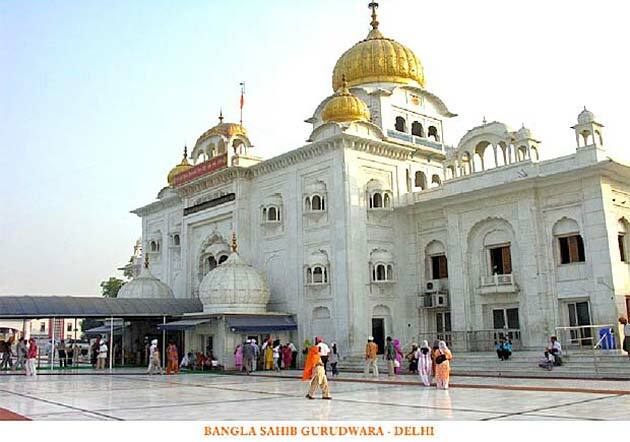 Visit Gurudwara Bangla Sahib, located in New Delhi, the most prominent Sikh gurdwara (house of worship) which holds a special meaning in the hearts of the thousands of devotees who visit. Originally a bungalow of Indian ruler, Raja Jai Singh, Gurudwara Bangla Sahib came into existence in 1783 as a symbol of the benignant Guru Har Krishan Sahib Ji, eighth guru of the Sikhs, who served the downtrodden during the epidemic of 1664. Embellished with a golden dome as well as marble walkways which pave the way to the prayer hall, Gurudwara Bangla Sahib is mesmerizing from the very first glimpse. On the flagpole resides the symbol of the Sikh contingent and, true to Sikh community, a kitchen or langar hall is located within the premises where volunteers serve food for one and all. Next, enjoy the walk to Rajpath (approx. 1 hr), which is the ceremonial boulevard that runs from Rashtrapati Bhavan on Raisina Hill, through Vijay Chowk and India Gate, and to the National Stadium, all the while flanked by beautiful gardens and fountains that are floodlit at night. This area was planned by British architect, Edwin Lutyens, who wanted a panoramic view of the city of Delhi from the Viceroy’s palace. The annual Republic Day celebrations are held on this lane every year. The important buildings and landmarks surrounding Rajpath include secretariat buildings, Rashtrapathi Bhavan (the residence of the President of India), Vijay Chowk (Victory Square), and the India Gate. Since the stretch is surrounded by various buildings that are politically important, it happens to be a highly protected area with very tight security. Later, continue your walk to India Gate (approx. 30 mins). 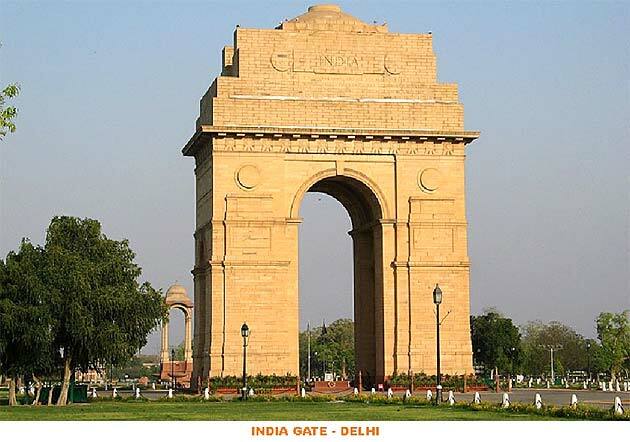 Of all the major attractions of Delhi, India Gate is one of the most-visited tourist spots. Situated in the heart of the city of Delhi, India Gate stands tall as one of the national monuments of the nation. The 42-meter-high monument is built in resemblance to the Arc de Triomphe in Paris. The memorial, which was originally called the All India War Memorial, commemorates around 70,000 soldiers who lost their lives fighting for the British Army during World War I and the Third Anglo-Afghan War of 1919. Next you will drive to Red Fort (visit from outside). This imposing 17th-century fortress is built from red sandstone and is surrounded by a huge 33-meter-high boundary wall. Inside are exquisite palaces and beautiful gardens. Opposite the Red Fort lies Jama Masjid (Friday Mosque), made of red sandstone and white marble, and completed in 1656 at a cost of one million Rupees. The mosque has perfect proportions and is India’s largest mosque, where more than 20,000 people can kneel in prayer. After sightseeing, drive back your hotel for overnight. After breakfast, drive to Agra. Standing on the right bank of the river Yamuna, Agra was once the seat of the Mughal rulers, the zenith of art, and the site of an enshrined romance – a town famous for its beautiful medieval monuments. The passion of the Mughals for building endowed Agra with some of the loveliest buildings in the world. 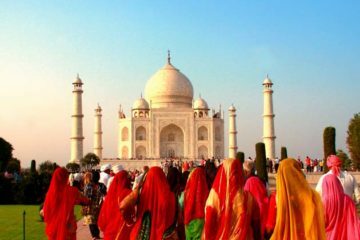 On arrival in Agra, transfer to your hotel, then enjoy some sightseeing. Visit the Taj Mahal (closed on Fridays). A poignant song of marble, the Taj Mahal stands serene and awesome on a raised marble platform by the banks of the Yamuna. The most extravagant monument ever built for love, this is a tribute to the timelessness of love and art. One of the seven modern wonders of the world, the Taj Mahal expresses Emperor Shah Jahan’s affection for his queen Mumtaz, who died giving birth to their 14th child. 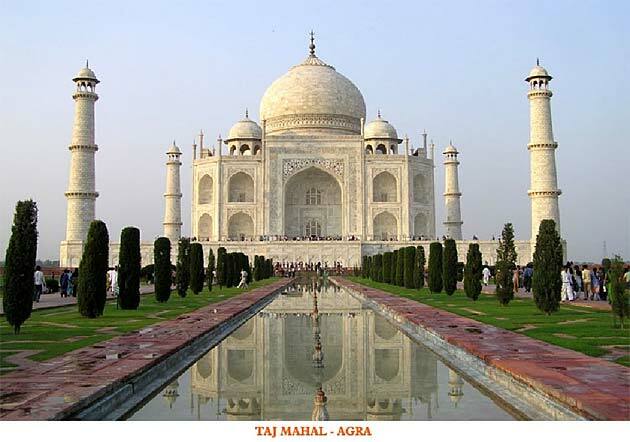 The Taj was constructed from 1631 to 1653 by workers who were gathered from all over the country and from central Asia. About 20,000 people were recruited to translate this dream into reality. The main architect was Isa Khan, who was brought from Iran. 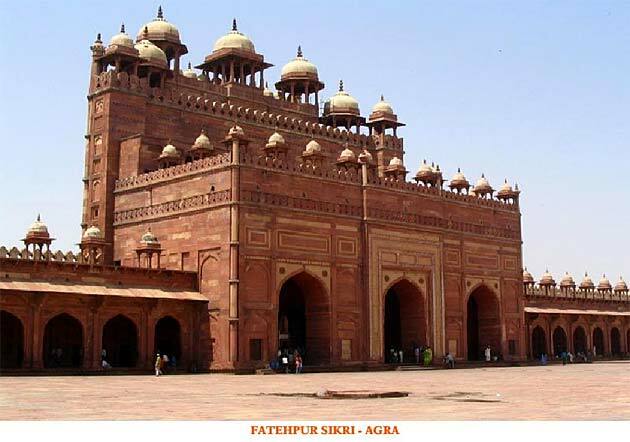 Also visit the Agra Fort, situated on the west bank of the river Jamuna, made by the Mughal King Akbar in the 16th century and completed by his grandson Shah Jahan, who was imprisoned by his son Aurangzeb for 8 years in this fort before his death. Overnight at the hotel. After breakfast, enjoy a Mughal Heritage Walk (approx. 1 km). The Mughal Heritage Walk is part of a Community Development Program being implemented with support of Agra Municipal Corporation, USAID, and NGO, Centre for Urban and Regional Excellence. It seeks to build sustainable livelihoods for young people and women from low-resource communities and to improve their living environments through infrastructure services and integration within the city. It focuses on highlighting the lesser-known monuments of Agra along with its people, and linking them to the tourism industry. View of three significant Mughal Era monuments which are rich in architectural heritage: Gyarah Sidi, Humayun Mosque, and Mehtab Bagh. Walk through the agriculture fields to experience the agricultural practices and cropping patterns in the region. Walk through a historic settlement, Kachhpura, which depicts the lifestyle of rural India. 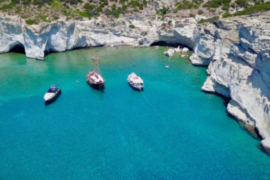 Experience the traditions and culture of this region, visiting a traditional house, experiencing the customary welcome of guests, and viewing local folk dance and play. Observe the leather shoe making technique which makes Agra an exporter in the shoe industry all across the globe. Discover local handicrafts and other products made by the community as souvenirs for visitors. This interesting walk ends at Mehtab Bagh. This 25-acre garden, constructed from 1631 to 1635 alongside the Yamuna River, is one of the most beautiful baghs (gardens) in the city. The garden is a hotspot among locals and tourists alike because of its exquisite location, parallel to the majestic Taj Mahal. It is also called the Moonlight Garden as it gives a splendid view of the Taj on moonlit nights. The garden is not only known for its location, but it is also loved for being an exhibition of the Mughal Empire’s grandeur. History and beauty come together beautifully to create a visual feast here, with an aura of resounding peace. After this walk, drive to Bharatpur, pausing on the way to visit Fatehpur Sikri, the beautiful and deserted medieval city built by Akbar the Great in the 16th century to serve as the capital of his vast empire. The complex consists of religious, residential, and administrative buildings. The Mosque here is considered to be a copy of the Mosque at Mecca and is extremely elegant, containing elements of Hindu and Persian design. Housed here is the Shrine of Sheikh Salim Chisti, one of the greatest Sufi saints of the Muslim world. Later, continue your drive to Bharatpur. 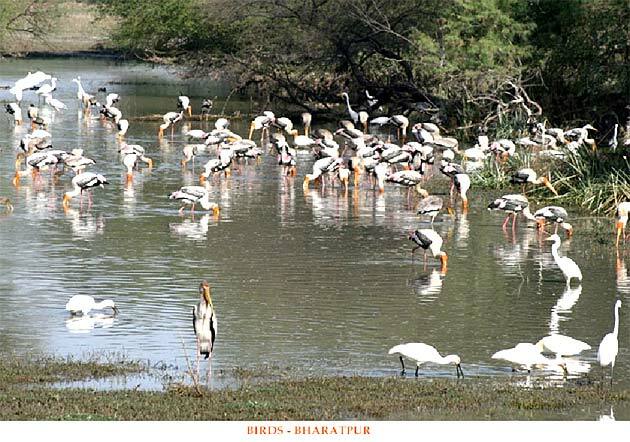 Bharatpur Bird Sanctuary, also known as Keoladeo Ghana National Park, was established in 1956. Now a UNESCO World Heritage Site, the sanctuary used to be a part of the private shooting reserve of the Maharaja of Bharatpur. This 29-square-kilometer marshland is one of the finest bird sanctuaries in the world, with over 360 species of birds, of which 117 are native to the region. Among the many bird species to be seen are egrets, storks, ducks, Chinese coots, kingfishers, spoonbills, sarus cranes, and several birds of prey, including falcons, marsh harriers, and eagles. Of ducks alone, 80 species can be spotted here. There are also chital, Nilgai, deer, wild cats, hyenas, and wild boar, whilst near the entrance there are usually some very large rock pythons. From November to February, northern hemisphere migratory birds visit the park from China, Europe, and Siberia, including the rare Siberian Crane. Early in the morning, enjoy a rickshaw ride in the park. Later, drive to Ranthambore. Ranthambore National Park is one of the largest and most famous national parks in North India. It is named after the historic Ranthambore fortress that is found within the park. The park covers an area of 392 square kilometers. Bound to the north by the Banas River and to the south by the Chambal river, Ranthambore lies at the edge of a plateau. There are several lakes here as well as a variety of plants and animals. 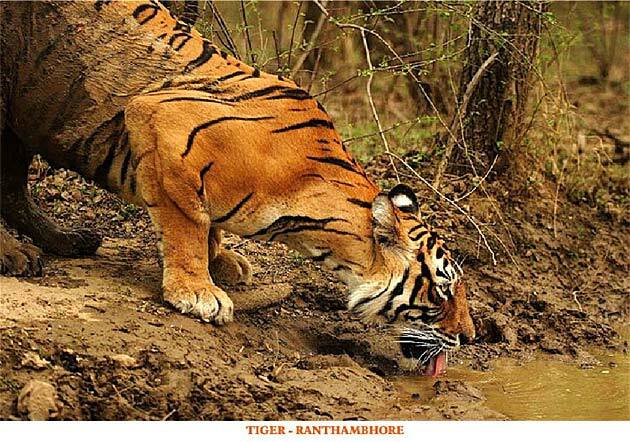 However, Ranthambore’s pride is the population of tigers prowling in their own natural habitat. The other fascinating creatures you can see include leopards, striped hyenas, chital, chinkara, sambhar deer, langurs, civets, macaques, sloth bears, black bucks, Indian wild boar, five-striped palm squirrels, Indian flying foxes, and mongoose. A visit to Ranthambore National Park can surely be a rewarding experience for all wildlife enthusiasts. Enjoy an early morning enjoy game drive in a Canter (open mini truck). Return to the hotel for breakfast. Ranthambore is a dry deciduous forest replete with several lakes, rivulets, and a magnificent ancient fort overlooking the park. Here one can see a large variety of birds, including an impressive number of waterfowl and birds of prey. The bodies of water are home to marsh muggers, turtles, and pythons. The park also has an abundant population of Sambhar and cheetal as well as nilgai. After some rest, enjoy an interesting walk to Ranthambore Fort. 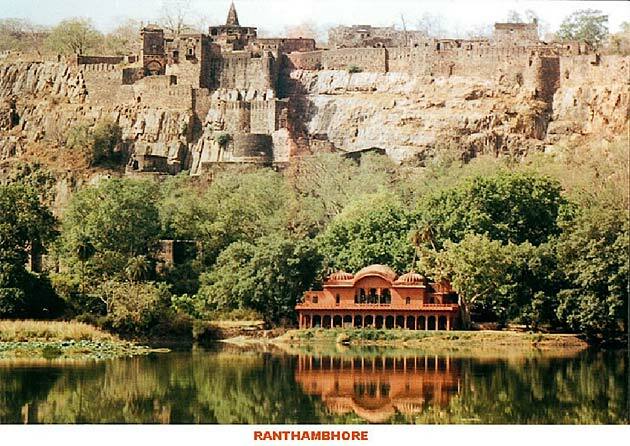 Ranthambore Fort is said to have gotten its name from two adjoining hills: Rann and Thambhore. It lies on Thambhore hill, overlooking Rann, and offers some breathtaking views of the park. The walls of the fort are about 7 kilometers in length and enclose an area of nearly 4 square kilometers. All around the fort, one can see many old ruins including palaces, temples, cenotaphs, step-wells, and houses. After breakfast, drive to Jaipur. Maharaja Jai Singh II built Jaipur in the 18th century. It is a planned city, built with ancient Hindu rules, and the colonial capital of a richly colorful state. In 1853, the whole city was painted pink to welcome the visit of Prince Albert. Jaipur is the biggest manufacturing center for marble statues of Hindu and Jain deities. Upon arrival, transfer to your hotel. Later in the afternoon, enjoy an interesting walk of around a half kilometer. On this walk, you will be able to see a colorful local market and many local people. You will begin your walk at Choti Chopad and continue through the narrow by-lanes until you reach Chandpole Bazaar and Khajanewalo ka Rasta, finishing your walk at a marble statue market. The royal city of Jaipur offers world-class quality marble work and intricate carvings and is the largest manufacturing center for marble statues of Hindu and Jain deities. 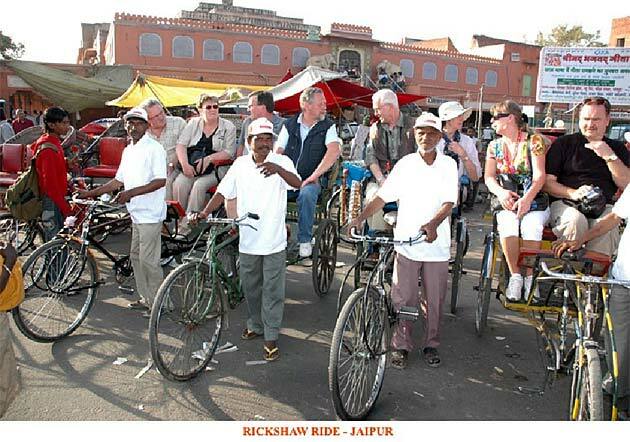 Next enjoy a rickshaw ride down the narrow lanes of Jaipur, through the hustle and bustle of the old bazzars. The humble cycle rickshaw is not only the common man’s beast of burden, but also a way to generate considerable employment; most of all, however, in an age when our cities are beset by the pollution menace of the automobile, it provides perhaps the only viable non-polluting alternative for the short-haul. For us, this ride will serve as a nostalgic trip through the Old City areas, where you will witness almost every imaginable mode of surface transport on the same street. Your passenger seat will not only provide panoramic views, but it will also afford you the opportunity to enter those narrow lanes of the Old City where automobiles cannot go. 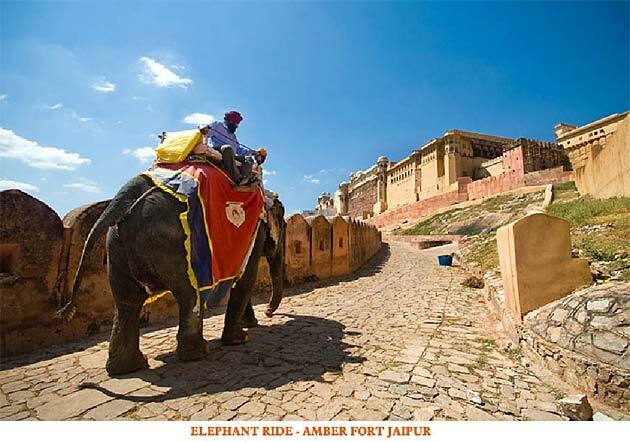 After breakfast, enjoy an excursion to the Amber Fort by jeep/elephant. This city fort is situated 130 meters high, with the Aravalli hills all around it, in a valley 11 kilometers north of Jaipur. It was the ancient capital of the Kachhawaha Rajputs until 1037 AD. After visiting the fort, drive a couple miles in an open jeep, then take a walk in the countryside. The walk takes you on a rural forest track with no urban civilization in proximity. You will pass by a medieval stepwell, the Ancient Delhi Gate, and a rescue center for circus tigers. Trek through and around the Nahargarh Forest Area, winding past small village hutments and a pretty medieval temple, ending at Dera Amer. This walk offers fascinating local flora and fauna, birdlife, and the possibility of seeing antelopes and other wildlife. The whole trek is about 2-3 hours, and culminates with a hot lunch at camp. Later, visit Jantar Mantar, constructed in 1728-34 by king astrologer, Jai Singh II. The instruments are built of stone with marble facing on the important planes for measuring the harmony of the heavens. Each instrument serves a particular function and each gives an accurate reading. After breakfast, drive to Deogarh. 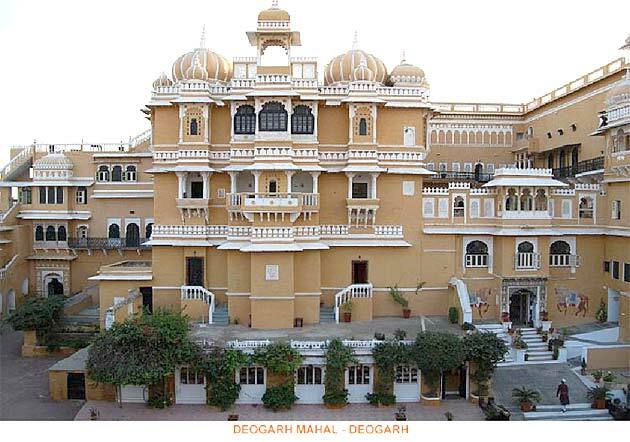 Deogarh Mahal is a heritage hotel, originally built in the 17th century and now converted into a heritage hotel which offers an unforgettable experience and a comfortable stay. 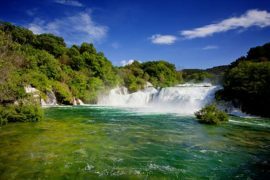 It stands atop a hill and offers a commanding view of the surrounding mountain range and the numerous lakes which are strewn across the countryside. With its greying battlements, domes, turrets, jharokhas, and huge gateways, it is a picturesque sight from the town below. As soon as you glimpse the Deogarh Mahal, you can see that its rulers must have been serious players in the Mewar aristocracy, their magnificent fort a fitting stronghold for one of its sixteen “umraos,” the most senior feudal barons attending on the Maharana of Udaipur. On arrival in Deogarh, transfer to your hotel. 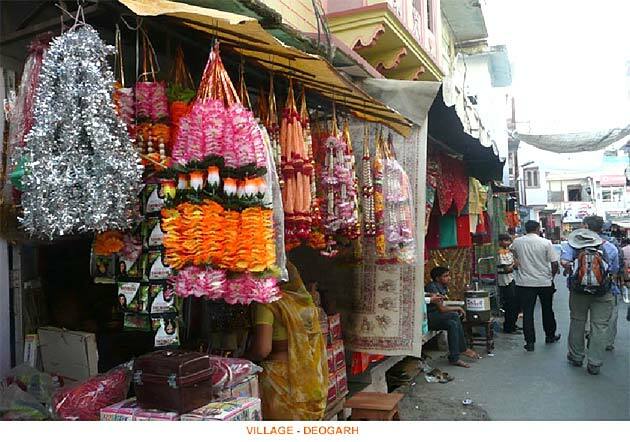 In the afternoon, enjoy a visit to Deogarh Village and watch villagers performing their day-to-day activities. See women around a community well fetching water buckets, washing clothes, and carrying water in beautiful matkas (clay pots) on their heads. Feel free to join a group of people sitting under some shady trees or in open courtyards as they discuss everything from world politics to local and domestic issues. You will also have the opportunity to visit a village market where you will see various small shops of sweets, grocery, vegetables, fruits, and other utility items. Watch different artisans at work, including potters, cobblers, textile workers, carpenters, jewelers, and more. 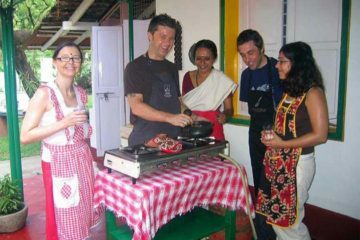 These artisans will demonstrate their specific crafts for you. Enjoy watching a potter working on wheel or a cobbler making shoes and traditional juttis (pointed shoes). The traditional textile work of Rajasthan is mainly done in villages by small artisans who use very old techniques of dying and printing. Natural colors are used for dying clothes and all the work is done by hand. Colorful clothes spread in the open air for drying provide a wonderful sight. You can interact with these artists and also purchase their beautiful handmade items. Early in the morning, enjoy a two-hour nature walk. 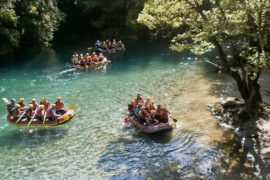 This walk will include a visit to two villages, combining nature and culture. It will be refreshing to see the local people in their morning routines (kids going to school, ladies tending their houses, old people sitting in courtyards). You will truly see the life of the local people and gain an understanding of the culture. Return back to the hotel for breakfast. After breakfast, drive to Ranakpur. On arrival in Ranakpur, transfer to your hotel. 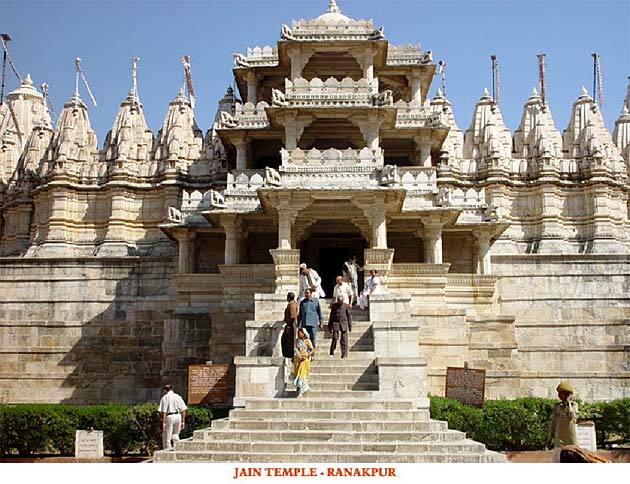 Later in the day, enjoy a visit to Ranakpur Jain Temples. Renowned for some marvelously carved Jain temples in amber stones, Ranakpur is one of the five holy places of the Jain community. These temples were created in the 15th century AD during the reign of Rana Kumbha and are enclosed within a wall. The central Chaumukha, or four-faced temple, is dedicated to the venerated Tirthankara Rishabhji. Open on all four sides, it enshrines the four-faced image of Adinath. Sprawling over 48,000 square feet, the temple is an astounding creation with 29 halls and 1,444 pillars, all distinctly carved. Images of 24 tirthankars are carved on the mandaps, or porticoes, in a corridor around the shrine with each mandap having a shikhar, or spire, adorned with little bells on the top. The gentle breeze wafting through the corridors moves the bells, creating celestial music all around the complex. Rising in three stories, the temple has four small shrines with 80 spires supported by 420 columns. Two temples, dedicated to the Jain Saints Parsvanath and Neminath, face the main temple. The temples have beautiful carvings similar to that of Khajuraho. Another temple worth visiting is the nearby Sun Temple, an eighth-century temple dedicated to the sun god. This temple has polygonal walls, richly embellished with carvings of warriors, horses, and solar deities riding splendid chariots. After an early breakfast, drive straight to the starting point of your walk, the 10th-century Jain temple called Muchhala Mahavir. The distinctive feature of this temple is the statue of Lord Mahavira with a moustache. The two statues of elephants guarding the gateways are splendid examples of temple decoration. Traditionally known, as Jain Dharma, Jainism originated in Ancient India. The Jains follow the teachings of Tirthankaras, which can be literally translated as Prophets. Jainism stresses spiritual independence and equality of all life with particular emphasis on non-violence. The Jains have an ancient tradition of scholarship. The Jains are the best-educated religious community in India and the Jain libraries are India’s oldest. Please note, as the Jains are strict vegetarians, one is not allowed to take anything made of leather into a temple: shoes, belts, etc. will have to be left outside. After the visiting the temple, start your walk towards Thandi Beri. 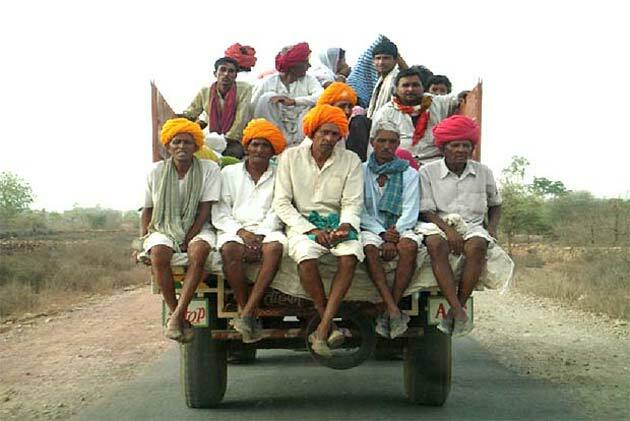 Rajasthan, the land of robust Maharajahs and ambrosial Maharanis, also houses a divergent colony of traditional tribes, who constitute around 12 percent of the state’s population, or roughly double the country’s average. Due to the Aryan invasion in Ancient India, the tribal peoples were cornered into the Aravalli Ranges in Rajasthan, where they reside today with their own social system and customs. The tribes share common characteristics which seem to articulate their past together, but it is the idiosyncrasies in their costumes and jewelry, fairs, and festivals that set them apart from one another. As all members of the clan are believed to be related to one another, marriages are generally arranged outside the community. With a very low literacy rate, many of these destitute folks have religion and victuals closely related to Hindu customs. About ten minutes into your walk, you’ll come across the village of a tribe called Gharasiya. The Gharasiyas are sheep herders who live in small villages. You will walk through one such village and will be able to see the lifestyle of these tribes from very close quarters. Continue your walk on a narrow trail, crossing a small stream on the way. Gradually, the forest around you will grow dense. After about 40 minutes, you will reach a small Hindu Temple in the middle of nowhere. Hinduism originated in the Indian subcontinent and about 80 percent of Indians are Hindus. With its origins in the Vedic civilization, Hinduism has no known founder, being itself a conglomerate of diverse beliefs and traditions. It is believed to be the world’s oldest existing religion and has approximately a billion adherents, of whom about 905 million live in India and Nepal; this makes it the world’s third-largest religion after Christianity and Islam. Walk another 20-25 minutes to a manmade body of water called Thandi Beri. You are now in the middle of a thick jungle, the core area of the Kumbhalgarh Wildlife Sanctuary. This area is rich with migratory birds, which fly from Siberia to South Asia during the winter. With a bit of luck, one might even be able to see a crocodile warming itself up in the winter sun. There are also a few species of antelope in this forest, including the Nilgay, the Indian blue bull, and the Indian Gazelle. Later, continue the drive to Udaipur. Udaipur is known as the Venice of the East. Lying in the Girwa Valley amidst the Aravali hills of South Rajasthan, it has to its credit some beautiful temples and gardens. The city is considered a romantic city with lakes, gardens, temples, and an oasis in the the desert. On arrival in Udaipur, transfer to your hotel. Later in the afternoon, enjoy a public boat ride on Lake Pichola, which derives its name from Pichola Village. Maharana Udai Singh enlarged the lake after he founded the city of Udaipur. This picturesque 4-kilometer-long and 3-kilometer-wide lake encloses Jag Niwas and Jag Mandir Islands. The City Palace extends along its eastern banks. After breakfast, visit the City Palace built on the banks of Pichola Lake by Maharana Udai Singh in 1570. The impressive complex of several palaces is a blend of Rajput and Mughal influences. Half of it is still occupied by the Royal family, and part of it has been converted into a museum. After visiting the Palace, you will start a walk of the old city, which will last around 45 minutes. The walk starts at the Tripolia Gate of the City Palace. This part of the Bazaar is full of small shops selling handicrafts on both sides of the road. Further down the road, there is a very famous Hindu temple called Jagdish Temple. The Temple is dedicated to Lord Vishnu, called the preserver of the universe. Continue your walk down the road towards the Clock Tower where you will see many interesting local shops selling different articles of day-to-day requirements. From the Clock Tower you’ll turn in to the Silver Market, where you will see many shops selling silver jewelry and articles. Further down the road are shops for handmade shoes, which are typical of the region. Here you can buy some of the typical embroidered shoes called Jutties. At the end of the road, you will enter the vegetable market square. You will see many ladies sitting around bamboo baskets, which are used by the vegetable vendors to display their fresh vegetables. The walk will end at the vegetable market. After this interesting walk, drive back to your hotel. Later in the afternoon, visit Sahelion ki Bari. The Sahelion-ki-Bari Garden was built in the early 18th century as a retreat for ladies of the royal household to spend their time in leisure. The enchantingly beautiful garden is famous for its lotus pool, fountains (in the shapes of birds), lush green lawns, flowerbeds, and marble pavilions, offering a breathtaking view to visitors. 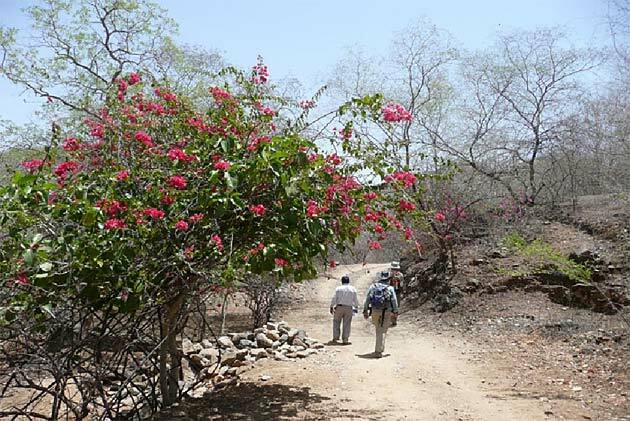 In the evening, enjoy a walk from Dhudh Talai to Maachla Magra. This is a very exciting 45-minute walk to the top of Maachla Magra. It is an easy uphill walk with a cemented path. One gets tremendous views of Udaipur city during this walk; the best views of course can be had from the top of the hill. From here one can see three lakes clearly: Lake Pichola, Fateh Sagar, and Swaroop Sagar. During clear weather, one can see the far-lying Govardhan Sagar too. One also gets a bird’s eye view of the City Palace, Jagdish Temple, Sajjangarh (the Monsoon Palace), and the entire city. Enjoy a relaxed breakfast and a morning at leisure. You will be transferred to the airport to board your flight to Delhi. On arrival in Delhi, transfer to your hotel for overnight.